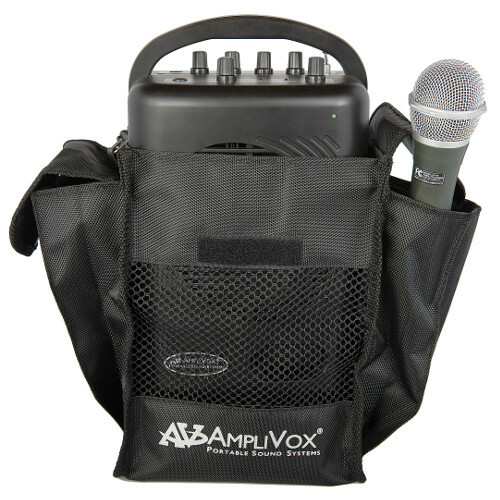 It comes with three styles of wireless microphone (handheld, headset, and lapel), each compatible with built-in dual channel VHF wireless microphone system featuring two person simultaneous usage. The wireless system has a range of 100 feet. Loaded with a media player that gives you the ability to play recorded audio from a SD card or a USB thumb drive and includes FM radio with remote control. You can even record a presenter’s speech that is spoken into the microphone onto the thumb drive. A full set of controls include wired mic input with wired microphone volume, wireless microphone volume, wireless antenna, echo effect, auxiliary volume, tone control, MP3/FM volume and recharging connect. The SW245B is compact and lightweight, but versatile and rugged enough for indoor as well as outdoor venues, offering optimum usability. Built-in rechargeable SLA battery, for up to 8 hours working time and 30 hours standby time.